I think the smallest chick died. 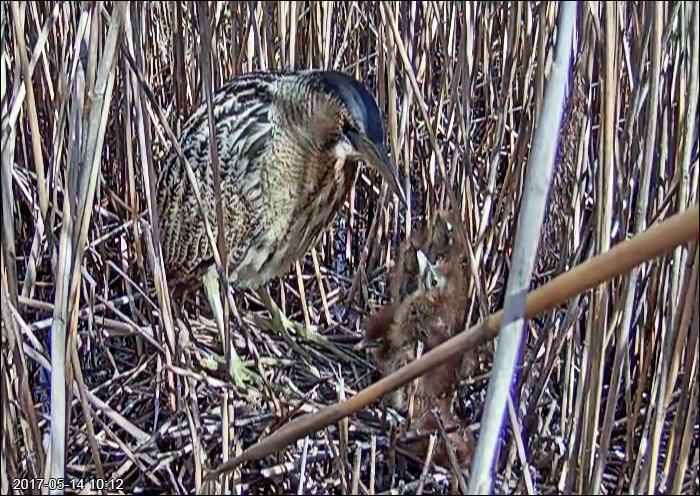 It is lying at the side of the nest and doesn't move when mama comes. One other chick is also small compared to the other 3. It doesn't fight a lot for food and is walked over by the others. Almost no wind this morning. 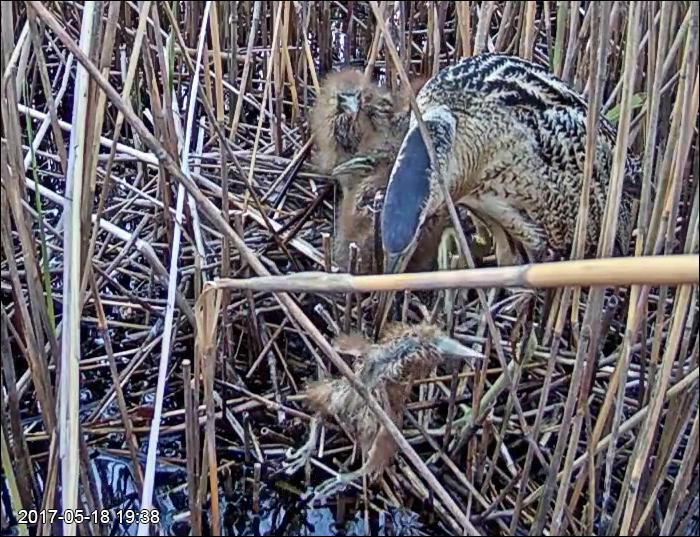 Mother arrives to feed the chicks and leaves again. Daddy is singing (booming) in the background. 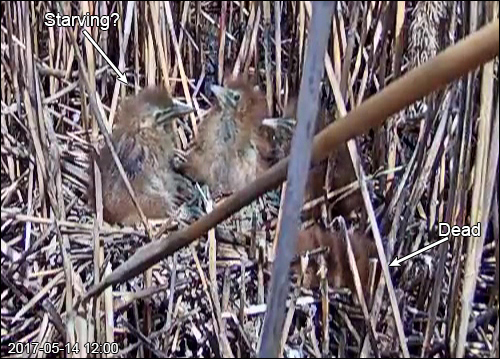 Dead chick on the lower right of the nest? 12:20 One is outside the nest. But came back. Is the dead one really dead? Yes, I think it really is. There are four alive. Yes, it must be dead. It has been lying there for hours and didn't move when the mother came. Yesterday it didn't manage to get food (the times I watched) and was sat on by the others. I wonder if number four will survive. But first she ate from it (14:03). Or she ate the bugs around it, can't tell exactly. 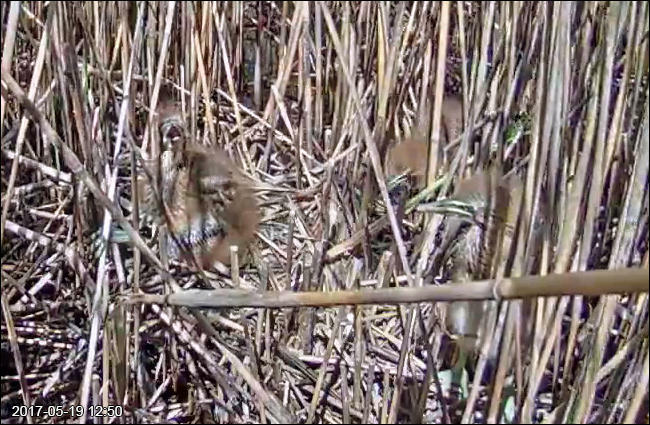 At 13:41:56 the chicks suddenly stood upright and looked op to the sky. Suddenly there was a low cry of some bird I never heard before. 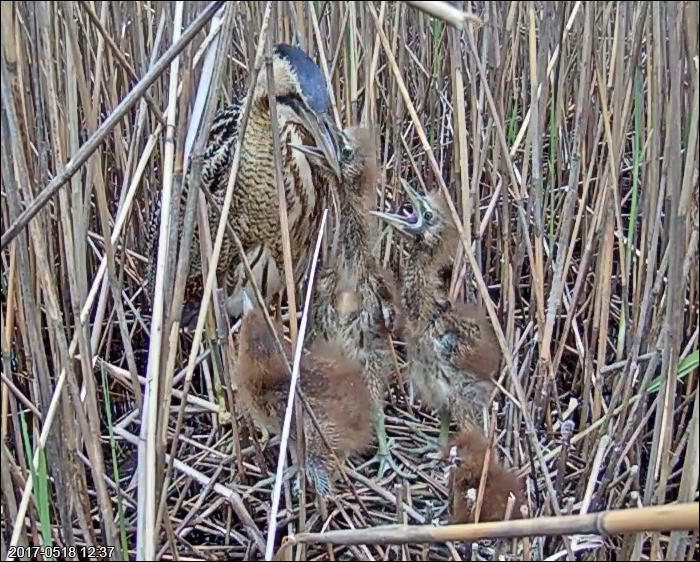 Then movement in the reed, I guess the mother. She walked in the background later. 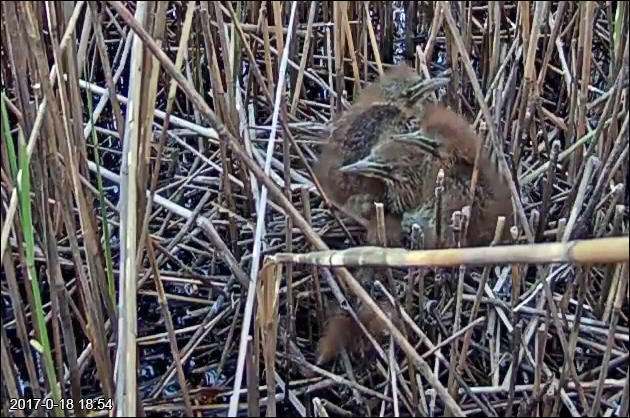 At 13:44 she came to the nest. Very noisy chicks, the fourth one is much smaller than the others. I don't think the youngest chick will survive very long. It hardly beggs, and is ignored and trampled upon. Liz, I think he stands no chance. He is much too small and weak now to compete with the others. Tiny one is all alone, almost in the water. Sometimes it still moves. It is dead now. Removed by mother, five minutes after I saw the last movements. 9:52 Feeding, it did not beg for food. This is hard to observe. It calls in the same way as the little chick yesterday. Two wandering outside the nest, perhaps to find some shade. Liz, as far as I have seen, all three are begging and all three are being fed.